What is ESL (English as a Second Language)? This course is related to learning of English as a Second Language (ESL) which is the use of everyday English by speakers who belong to different native languages or belong to those countries where English is the second major language after national language of the nation or state. ESL has evolved in two directions: first for those who intend to live in English speaking environment, second are those who are not the part of English speaking environment. It is one of the most widely used language in letters, memos, reports and other forms of communication. It is spoken natively in may countries than any other language, in comparison to from Chinese and Spanish. Businesses throughout the developed world use it as a standard language to conduct commerce, even between two companies of non-English-speaking origin. As a result, there is a perpetual demand for access to an English language course. English is the result of multiple cultures spreading over vast distances and incorporating other languages and cultural influences along the way. The European Union, United Nations and a lot of Commonwealth countries also use English as their official language. . Being able to fluently speak and write the English language is beneficial because it raises an impression that you can effectively communicate with others. Learning everything about English as a Second Language is now possible with the help of most effective and economical platform of Brainmeasures because of its ability to provide you with detailed requirements of speaking English effectively. This ESL certification course from Brainmeasures guarantees you to provide detailed learning platform. ESL certification program allows you to learn more about the most common grammar and speaking rules that you need to follow for effective communication and writing English as a Second Language while also boosting your comprehension skills when reading contents in English. 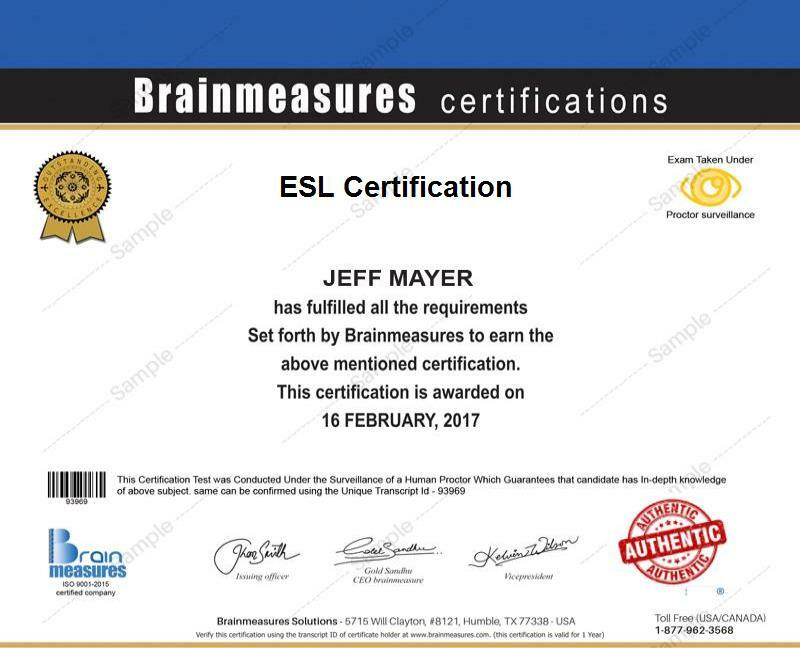 Once you receive your ESL program certification from Brainmeasures, you will no longer find it difficult to prove that you know exactly everything about the language. Receiving your ESL certificate from Brainmeasures also translates to a better flow of income. The average annual salary for those who hold executive, management, liaison, disseminator or presenters and such positions in an organization is around $80,000 per year and this amount may vary significantly based on the industry, location, company, benefits and experience of the individuals. Enrolling in the ESL certification program offered by Brainmeasures can definitely offer numerous benefits to individuals and business. It is suitable for anyone who wishes to hone their skills and knowledge in speaking and writing the English language while also improving their confidence when trying to use the language. Learning everything about the English language is also beneficial because it allows you to easily communicate with others and get stable positions in different business organizations. This certificate is widely beneficial for teachers, social analysts, anchors, newscasters, actors, students, managers, business executives, advisers, public relation officers, customer representatives, native English scholars, writers, diplomats and many others from any domain or industry.